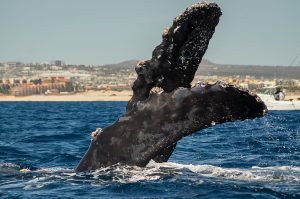 Whale watching in the Mexican Coast takes place from December to April and there is no better place to see this natural spectacle that in Los Cabos, Baja California Sur. The whales undertake the longest migration on this planet, crossing approximatively 6.000 miles (around 10.000 km), one way, to reach Mexicans warm waters during the winter and starting the journey back in late March. A pleasant climate, the shallow waters and abundant marine life, of the Baja California peninsula make a perfect place to give birth and raise their calves. Baja California Sur makes it also a perfect ground for mating, and this is why we get to witness the most spectacular behavior such as: breaches, tail slaps, peduncle throw. There are several ways to observe these magnificent cetaceans in their natural habitat: Cabo Trek offers a very educative experience with its marine biologist as guide. We also carry a hydrophone on board that will allow us to listen to the whales. Our 33ft boat is very fast and comfortable: cushioned seats and roof cover to ensure plenty of shade. Small groups for “best whale watching tour in Cabo” : Although our boat has capacity for over 20 people we close our whale watching tours at 10-12 guest, at the maximum, to allow the best possible experience. 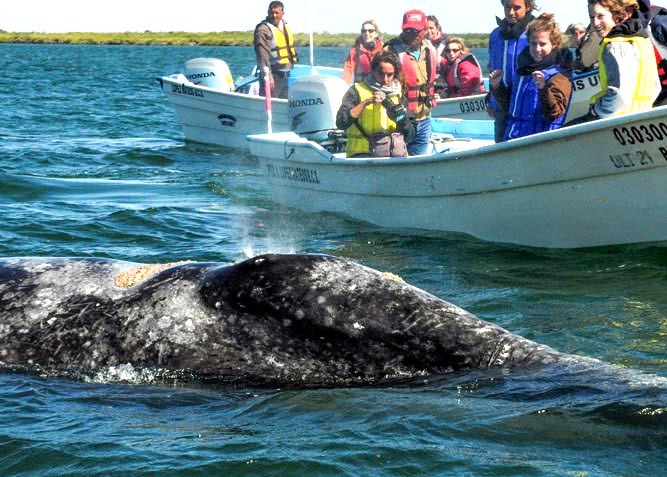 Starting from this year Cabo Trek offers also excursions to Magdalena Bay, Puerto Lopez Mateos for an incredible encounter with Gray Whales. This tour will allow enough time to discover the Baja California Sur region and get to know better the region while driving up north toward our destination. Puerto Lopez Mateos is a small fisherman town that is becoming increasingly popular for its amazing whale watching experience. Friendly locals and amazing fish food will enrich this expedition that you won’t forget in a long time! Cabo Trek, feel the difference!